Update, February 26: That special look at the gameplay of Two Point Hospital, Theme Hospital’s spiritual successor, has been given the added bonus of developer commentary over on YouTube! In case the gameplay shown at the PC Gamer Weekender was too plain, and didn’t have the dulcet tones of two of Two Point Hospital’s developers that you so needed, the gameplay has been given some special commentary on YouTube, explaining a little of what’s going on in the footage. You can watch it all above! Here’s our list of the best simulation games on the PC. Original story, February 17:If this brand new footage of Two Point Hospital gives you déjà vu, it’s probably because two of the developers from Bullfrog’s Theme Hospital are part of the team working on Sega’s follow-up to their 1997 cult classic. Revealed at the PC Gamer Weekender, the footage shows off the game’s UI and art style, which indeed look comfortingly similar to Theme Hospital’s, albeit with a modern coat of design polish. But the Theme Hospital DNA couldn’t be more clear – all the familiar elements are present, from mapping out office floor plans to placing examining tables. 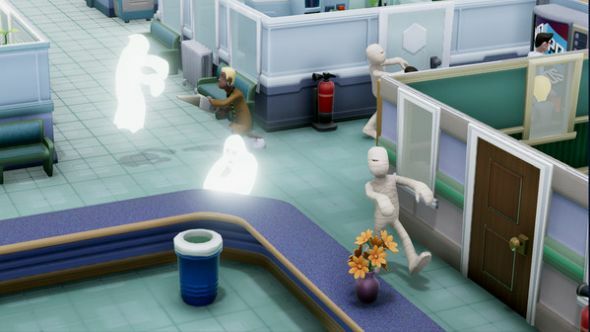 Two Point Hospital is due out this autumn.